Finance Department Punjab Government has taken an action on 18-07-2018 regarding Notification of Pension Increase 2018 for Punjab Government employees. 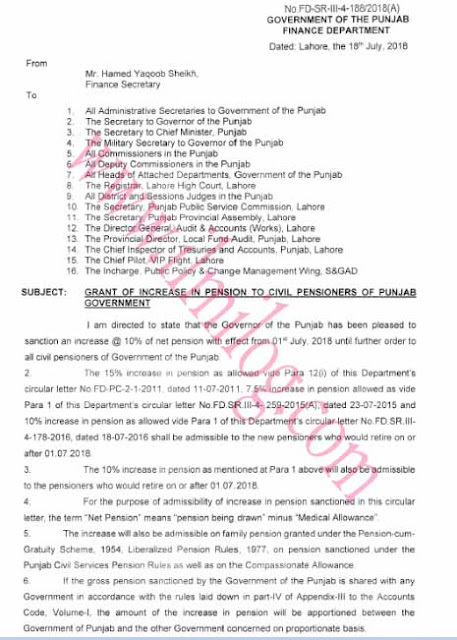 It is directed that the Punjab Governor has sanctioned an increase @ 10% of net pension w.e.f. 1st July 2018 till further orders for all govt. pensioners of Punjab. 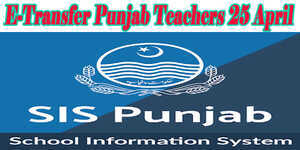 The 15% pension increase allowed vide-Para-1200 of the Department's letter No. -FD-PC-2-1-2011 dated 11th July 2011, 7.5% pension increase allowed as vide-Para-1 of the Department's letter No.-FD.SR.III-4-259-2015(A) dated 23 July 2015 & 10% pension increase allowed vide-Para-1 of the Department's letter No. -FD.SR.III-4-178-2016 dated 18 July 2016 will be allowable to new pensioners of Punjab who would be retiring on or after 01st July 2018.